The HiRISE instrument would make a great backyard telescope for viewing Mars, and we can also use it at Mars to view other planets, such as Jupiter. 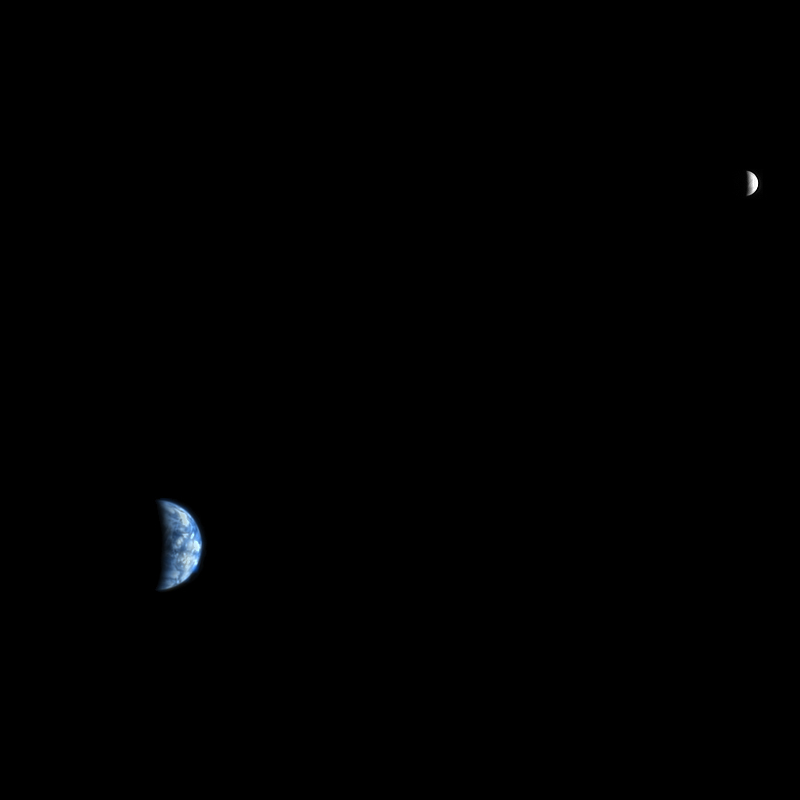 This is an image of Earth and the Moon, acquired at 5:20 a.m. MST on 3 October 2007, at a range of 142 million kilometers, which gives the HiRISE image a scale of 142 km/pixel and an Earth diameter of about 90 pixels and a Moon diameter of 24 pixels. The phase angle is 98 degrees, which means that less than half of the disks of the Earth and Moon have direct illumination. We could image Earth/Moon at full disk illumination only when they are on the opposite side of the sun from Mars, but then the range would be much greater and the image would show less detail. On the Earth image we can make out the west coast outline of South America at lower right, although the clouds are the dominant features. These clouds are so bright, compared with the Moon, that they are saturated in the HiRISE images. In fact, the RED-filter image was almost completely saturated, the blue-green image had significant saturation, and the brightest clouds were saturated in the IR image. This color image required a fair amount of processing to make a nice-looking release. The Moon image is unsaturated but brightened relative to Earth for this composite. The lunar images are useful for calibration of the camera.